The ruins of ‘Cammo House’ lie in the wooded Cammo Estate near to the river Almond in West Edinburgh. It was built in 1693 and is thought to have been the inspiration for the 'House of Shaws' in Robert Louis Stevenson's novel Kidnapped. The estate was designed and laid down by the architect Sir John Clerk in the years 1710 – 1726 and consists of large woods, fields, ‘Cammo House’, the farmhouse and the stables. During the 1950s-60s the house, the stables and to a certain extent the farmhouse buildings were neglected and fell into disrepair. The last owner lived in the farmhouse and eventually ‘Cammo House’ was abandoned to the vandals, who finally set fire to it and burnt the building almost to the ground. The demolished walls are now covered with soil and grass and the size and splendour of the house has been lost to time. Once it was the most beautiful of houses with horse draw carriages at its door, servants, parties and grand visitors of importance. The farmhouse was also abandoned and today it lies neglected and forlorn at the edge of the estate. It is up for sale and I suspect it will have to be re-furbished rather than demolished as I think it is a listed building. Substantial is size, it would make a beautiful home. 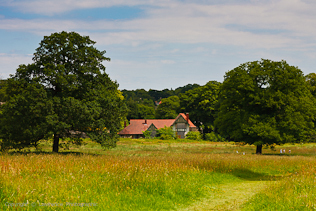 The estate was handed over to ‘The National Trust’ and today; the public have access to this country park for walks, picnics and to experience a little bit of history. The photo web has been designed using Adobe Lightroom 5.7 Software.